An Affordable Price, Especially For What It Offers! This 3 Bedroom abi Sunrise is in excellent condition with plenty of space and a light and airy feel throughout. 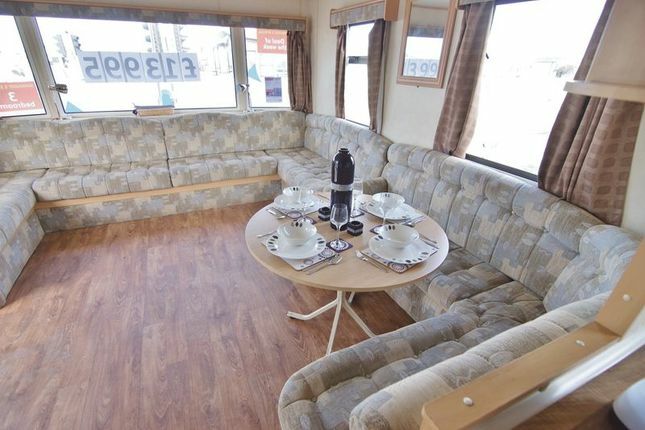 This abi Sunrise caravan is at an affordable price, especially for what it offers! In the open plan living area, the Sunrise boasts ample bench-style seating, which continues around the room so there's plenty of space for everyone. Light and airy living room with windows to three aspects. Includes large wrap around sofa with dining area and ample furniture and feature fire. Fitted kitchen with range of eye and base level units with wood effect work tops. Built in oven with four ring hob, under counter fridge and stainless steel single sink with mixer tap and drainer. Window to side elevation. Three piece suite comprising: Low flush WC, hand wash basin with pedestal and step in shower cubicle. Frosted window to side elevation. Master double bedroom with range of fitted wardrobes, overhead storage and bedside tables. Window to side aspect. Twin bedroom with wardrobe, overhead storage and bedside table. Window to rear elevation. Second twin bedroom with storage space including overhead storage, bedside table and wardrobe. Property descriptions and related information displayed on this page, with the exclusion of Running Costs data, are marketing materials provided by TEM-PO.CO.UK, and do not constitute property particulars. Please contact TEM-PO.CO.UK for full details and further information. The Running Costs data displayed on this page are provided by PrimeLocation to give an indication of potential running costs based on various data sources. PrimeLocation does not warrant or accept any responsibility for the accuracy or completeness of the property descriptions, related information or Running Costs data provided here.